Fifty years on from the successful 1967 referendum, we have all heard the Uluru Statement from the Heart. Aboriginal and Torres Strait representatives have told us that 'in 1967 we were counted, in 2007 we seek to be heard'. There's certainly one thing worse than minimal symbolic constitutional change accompanied by substantive change outside the Constitution, and that is no mention of Aboriginal and Torres Strait Islander peoples in the Constitution, either because we judged it all too hard or too compromised, or because we tried to achieve too much, too soon. Australians will not vote for a constitutional First Nations Voice until they have first heard it and seen it in action. The work needs to begin immediately on legislating for that First Nations Voice, so that it is operating as an integral part of national policy and law making, attracting national support for constitutional recognition. "One thing is certain following last week's cry from the heart at Uluru. There is no quick fix to the Australian Constitution." The Referendum Council should recommend that the government commence immediate consultations how best to set up a new Indigenous advisory council as a First Nations Voice. It should recommend that Parliament legislate for the creation of such an advisory council. It should recommend that any referendum be delayed until the advisory council is established and working well. The Parliament might then, and only then, consider legislation for a referendum proposing relevant changes to the Constitution. Other issues will wait for another day, or be dealt with outside the Australian Constitution. One thing is certain following last week's cry from the heart at Uluru. There is no quick fix to the Australian Constitution. Successful constitutional change acceptable to the Indigenous leaders gathered at Uluru won't be happening anytime soon. Let's take the time to get this right. 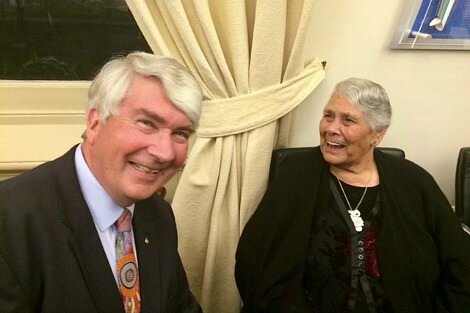 Main image: Frank Brennan with Lowitja O'Donoghue, former inaugural chairperson of the Aboriginal and Torres Strait Islander Commission. Finally, Frank, something that we can all hope and pray for. This is the real nitty-gritty. Hopefully the pollies will look sideways on the issue rather than blindly charging down the corridors of tunnel vision and quasi legality. Our First People's have spoken, we need to listen. And when we open our mouths to speak it should be to ask questions, to seek to understand what has been said. The last thing we need is for politicians or priests or any one of us to begin by announcing what's possible and what's not, or to start telling our First Peoples how they should proceed. We've had 200+ years of that and see where it's got us. The challenge for them was to reach consensus on what they wanted. The challenge for us is to discover how it can be achieved, in full. We should recognise the Aboriginal peoples as our seventh state, ceding to it the Commonwealth's Aboriginal powers. This would give them their own state parliament, as well as representation in the Federal Parliament. Frank, the Native Title process has plateaued, now we need to consider how to turn recognition into meaningful engagement with the rights that Native Title suggests. Your second last paragraph may offer a way forward. However, at this stage we are being aspirational, given the problems with lack of engagement in the existing aboriginal communities. Real progress requires engagement with aboriginal in projects, which is well recognised in the communities, and is underway, thanks to better educational outcomes, but the limiting factor is the will in government and in the communities to make things happen. It gets down to having a generous heart with the resourcing. Thanks to Frank Brennan for hos great insights into the current situation into Aboriginal rights. As a person who was active around the Yes vote in 1967, I am very frustrated that it has taken so long for our indigenous people to have reach the current situation. So I can understand how frustrated they must be. I guess it makes us realise how conservative the Australian populace is generally - being led by a political party that uses the name Liberal, but which is very far to the conservative right. Hence its appalling treatment of asylum seekers, its taking of oil and gas from Timor-Leste's 1/2 of the Timor Sea and its refusal to recognise the rights of the West Papuans who have suffered genocide at the hands of Indonesia for 55 years. The Constitution is a big problem. It was designed by the ruling elite for their own interests and certainly they did not want to include mention of Aboriginal people. And, because of their conservatism, Australians have been loathe to change it via referenda since. A thank you must go to Frank Brennan again who this week delivered the Lowitje O'Donohue Oration at the Adelaide University which went into more detail about the issue. Australians of goodwill must continue their support of the land, human and development rights of our Aboriginal people which will lead to a meaningful mention of them in our Constitution and in our national life. I think Nev Hunt is on the ball with his reference to a native title plateau, to which I see with others the backdrop of colonial conquest of this land, yet with indigenous spiritual sovereignty enduring. This can be placed then in a context of physical entropy with its human analogue of, inter alia, values-muddle. That is, with native title intact, indigenous sovereignty is one of many currents of meaning, spiritual and otherwise, that prevail in Australia today. The constitution should acknowledge the special place of indigenous sovereignty, and people of goodwill should promote the rights of all Australians to be protected and promoted, on the ground wherever they might happen to live. I have my doubts that a centralised consultative body can help, given my experience of remote Australia where I have seen values-muddle across the board, indigenous and non-indigenous. With all due respect Ginger Meggs, I think you seriously misunderstand where we are in the political process. The Aboriginal and Torres Strait Islander groups meeting under the auspices of the Indigenous members of the Referendum Council have concluded their meetings and made a recommendation which now goes to the full Referendum Council for their consideration. The Referendum Council is required to report to the Prime Minister and the Leader of the Opposition by 30 June on ‘options for a referendum proposal, steps for finalising a proposal, and possible timing for a referendum’. The Referendum Council needs to recommend to government a timetable for constitutional change with maximum prospects of a ‘Yes’ vote for proposals sought by Indigenous Australians. My approach has been to give full and respectful acknowledgment to the Uluru statement. The questions now are: if you want a First Nations Voice put in the Constitution, what are the best options for a referendum proposal? What are the best steps for finalising such a proposal? And what is the optimal timing for putting such a proposal in a referendum? The best answers to these questions require all Australians of goodwill to be on board, expressing their views and contributing to an optimal outcome ie. a constitutional change sought by Indigenous Australians and approved by the overwhelming majority of Australian voters. I respect those Australians like you Ginger who are content just to leave it to a Referendum Council of persons (Aboriginal and non-Aboriginal) nominated by the government of the day. But I suspect such a nominated body would appreciate hearing the views of community members, and not just those members of parliament who have decided to show their hand promptly. I think using the term "First Nations" is not going to help get a Yes vote and is one of the possible own goals that are being kicked. Despite the common usage in the US, the aboriginal tribes were not and are not "nations". I suspect Frank that there is a bit of misunderstanding both ways. I agree with you that 'an optimal outcome ie. a constitutional change sought by Indigenous Australians and approved by the overwhelming majority of Australian voters' is what we must pursue. But to my mind the achievement of the 'overwhelming majority of Australian voters' should be achieved by shifting the attitudes of that overwhelming majority, not by watering down the aspirations of our First Peoples as expressed in the Uluru statement. And attitudes can be shifted as we saw with the acceptance of post war immigrants. The Referendum Council has its role but, as you rightly point out, it is a creature of the representatives of the 'overwhelming majority' and responsible to those representatives. However, if it is to keep faith with our First Peoples whose considered opinion it sought and gained it ought not, to my mind, begin the watering down process. Nor should any of us on the sidelines. If achieving the outcomes that our First Peoples want is going to be too hard in the present climate, then the Council should be turning its attention to ways of changing that climate. The atmosphere that the Uluru Statement came out of was one of heightened intensity from everyone attending an occasion which took on a religious significance. Whilst many non-Aboriginal Australians could empathise, they are still a little confused, possibly even wary, about the practicalities of this Statement. Not all Aboriginals, including the distinguished Warren Mundine, agree with altering the Constitution. He believes all the changes necessary to make Aboriginal and Torres Strait Islanders' lives better can be achieved without this. The time for a real national conversation has begun. There is no magic wand to change things. Real progress, as always, will take effort. The first effort for ATSI people is to bring both the political elite and the general public onside about the need for change and what change, or changes, are necessary. Barnaby Joyce represents the sensible face of Australian conservatism. If you can't persuade him and those who think like him you will get nowhere. What Jackie Huggins said on the ABC is pertinent. Perhaps the consultative body necessary is already here without fanfare. Our sort of politics tends to work on an evolutionary, rather than revolutionary basis. Perhaps grandiose statements and grand schemes are unnecessary to the main game? That depends on how you define a nation, Margaret. Would you say the Scots are a nation ? Frank Brennan has been a voice for Our First People for quite some time and needs to be listened to, because he is on the ball, is frank and direct. I personally would suggest that First People persons would achieve a lot by being present in our legislatures, i.e by standing and elected to represent their communities, their views, values. We do have some representatives, but they are in desperate minorities. We also have footballers, journalists, etc, however more people are needed to stand and defend their communities. While I applaud Frank for his advocacy, his voice, however powerful, is definitely not enough. We need the voices of lawyers, journalists, businessmen/women and people on the street to create a momentum for the objective sought. Because from my perspective, legislative arrangements are not enough to create the change sought. I think we should not limit our working scope by trying to follow on what other countries like the US or Canada or China, etc have done. We can learn from them but do not have to restrict ourselves to their methods. Legislative change needs to be done in conjunction with community change, the man in the street attitudinal change.